Buses are the only means of public transport on the island and they can be limited, especially if you are wanting to reach many of the main sights and attractions in Cypus or on the island that are a little off the main public transport network. Many of the popular attractions in Cypurs such as Troodos Mountains, Famagusta and Aphrodites Baths all require transport to reach them and although they do have tour operators that run coach services to them, they can be a little difficult to get to on public transport. Over the past few years, the buses in Cyprus and bus services throughout the island of Cyprus have improved. This is generally due to them having to meet European Standards which is certainly a very good alteration for many reasons. Most of the bus companies that now operate in Cyprus are privately owned companies and are regulated by the Cypriot Government. Due to each district in Cyprus having its own privately run bus service, the one thing you will soon notice about the buses in Cyprus is that they all look different in appearance. Some districts and towns have a fleet of larger modern buses whilst others operate smaller mini bus services. Cyprus Bus Routes Each city, town, resort and village throughout Cyprus have their own bus services and bus routes and if you are wanting to catch a bus during your stay in Cyprus, you will obviously want to know when and where you can catch the bus! Most bus operators in Cyprus do have their own website and you can generally pick up a local bus service timetable from either the local bus station, tourist information office or a hotel. If possible, visiting the local Cyprus bus companies own website before you travel is advisable so that you know in advance the local bus times and routes and can then plan your trips according. Many of the local bus companies offer bus services to and from the airports in Cyprus, which are a very popular choice of transfer for many passengers as they offer a very cost effective form of transfer to and from the airports. Buses From Larnaca Airport Cyprus does not have a rail network, so unfortunately there are no direct trains to and from Larnaca airport, therefore transfers to and from the airport need to be by bus, car or taxi. 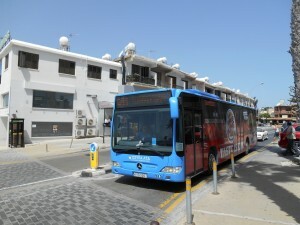 However, there are buses that run from the airport directly into the centre of Larnaca. These buses run every hour and are very cheap but if you are wanting to catch a bus to the many resorts towns and villages on the island that are located a little further distance away from the airport, you may be more restricted to a less frequent timetable. The local Cyprus bus that runs to and from the airport is an ideal form of transfer for passengers wishing to reach the centre of Larnaca itself and is especially popular with passengers who are travelling alone, simply because it is a cheap and viable option. If you are wanting to reach the popular resorts of Ayia Napa, Protaras and Paphos from Larnaca Airport, you may need to catch the local bus from Larnaca Airport into the centre of Larnaca and then catch a bus from Larnaca to your final destination. Bus Fares And Tickets In Cyprus The majority of Cyprus buses do let you buy a ticket from the driver as you get on the bus and this is certainly the case for the airport buses. However, it is possible to buy multi day tickets that allow you to ride on the buses as often as you like so long as you have a valid ticket. These tickets are well worth buying, especially if you plan on using the bus services regular throughout your stay. There are also concessions for children, OAP’s and members of the Military (when showing their ID card). There are various bus companies that run services linking major towns in Cyprus to the popular resorts and these services usually run daily from Monday to Saturday, generally, there is no service on Sunday. However, some of the buses that run to the major holiday resorts such as, Ayia Napa, Paphos & Limassol, do run on Sunday but you would need to check with the bus company for the times. Eman Buses: Tel 23 72 13 21 Ayia Napa – Larnaca Most rural villages and towns in Cyprus are connected to the closest major town by a bus service. However, these buses only run once or twice a day so to avoid missing them, make sure you check with the local bus company for the times. Also remember that these bus times, services and routes may change throughout the year depending on the season. Urban towns on the island all receive a more frequent bus service, especially in the summer months and in the popular tourist areas. During summer, these services are extended until midnight. As well as Cyprus bus services, there are also a number of coach and shuttle buses that operate from Larnaca airport. The information above is just a guide and if you wish to use the Cyprus buses during your stay, you should check the latest timetables to ensure you can reach your chosen destination using the public transport network.